On the home stretch to Rio 2016, Olympic pin collectors may anticipate a wave of board-shaped pins designed in homage to the city's surfing culture. Earlier this year, the U.S. Olympic Committee released a series of longboard pins inspired by Rio surfing culture. In the set, each pin matches an actual surf board created for a sponsor appreciation display planned at USA House. On the Olympic bid pin front, so far only one or two generic logo designs emerged from Budapest, Los Angeles, Paris and Rome, and there are some pins out there for the defunct Boston 2024 organization. At last night's 20th anniversary celebration for Atlanta's 1996 Games -- held in Centennial Olympic park with a stage for prepared remarks by several Games-related leaders -- LA24 Chairman Casey Wasserman decided the time was right for taking the drop, delivering the first boxed-set of new surfboard-shaped Olympic bid pins. The lucky recipient? Atlanta Committee for the Olympic Games CEO turned Augusta National Chairman Billy Payne. 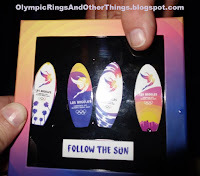 Wasserman handed the gift box of four surfboard pins while encouraging Payne and the crowd of thousands to "Follow the Sun" (LA24's bid theme) in support of America's next Olympiad. 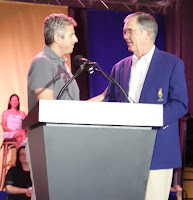 On stage Payne thanked Wasserman, stating he appreciated the surfing tutorial as, at least during Payne's first glance, the pins' shape was not as self-explanatory as intended. Standing in the photo pit at the conclusion of the event, I asked Payne for a peek at the boxed set, which he held up for a photo. It was fun to inspect the new pin treasures -- Payne would not let the box out of his hand, so he must have considered them "keepers." 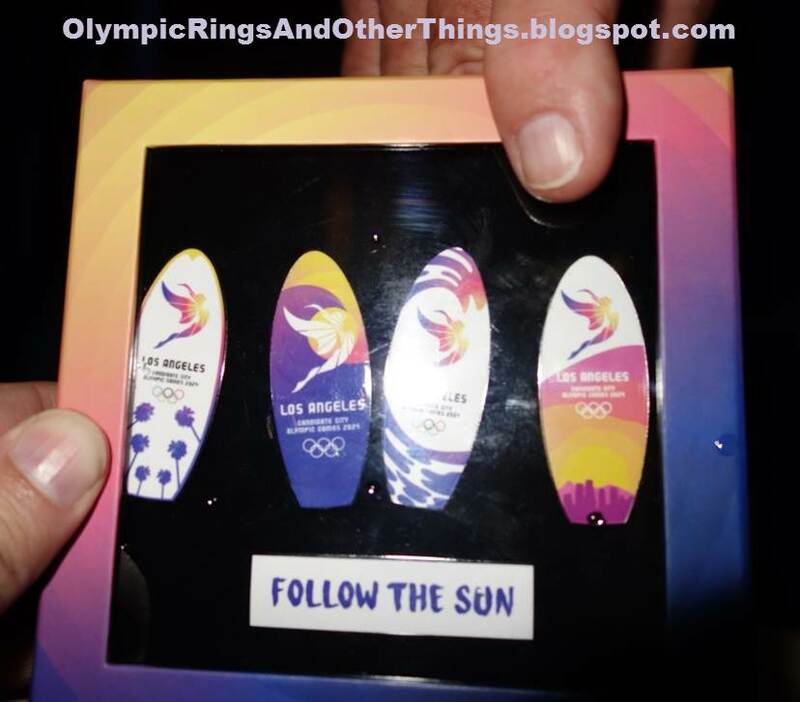 I'm no surfing guru, but upon inspecting the designs, each of the four pins appear to be wider than the longboard surfing pins the USOC previously released -- more in the shape of Payne's or my thumbprints. To me, the LA24 Olympic bid pins are more like wakeboards, perhaps to provide a wider space for the LA24 angel logo and the Olympic rings. I consulted some surfboard infographics and the aptly-titled "Riptionary" of surfing lingo, but found no surfboard shape exactly matched. But who cares? These pins are gorgeous! A possible fifth pin -- sans logos or rings -- appears to be a white cloisonné plaque on which "Follow The Sun" is painted in purple enamel. The cardboard presentation box also features colors from the bid palette. I asked the LA24 media relations team to confirm the quantity and potential availability of the new bid pin sets and so far this was their response. "Pins are a limited set, no plans for now on wider distribution." My guess is the pins may be a special VIP gift for visitors to USA House in Rio, where LA24 will have a special display or other "to be unveiled" elements. With known quantities historically a factor for bid pin collectors, I'll keep an open eye and ear for details. A boxed set of LA24 surfboard pins is now in the top five most-sought designs to add to my personal Olympic bid pin collection. Until such time, wishing everyone some glorious and smooth tube riding to the Games of the XXXIst Olympiad, and happy pin collecting to all. Nice looking pins…the LA bid logo looks a little like a combination of the Barcelona and Sydney logos but I guess they are all a variation on a them (of Olympic rings colors).